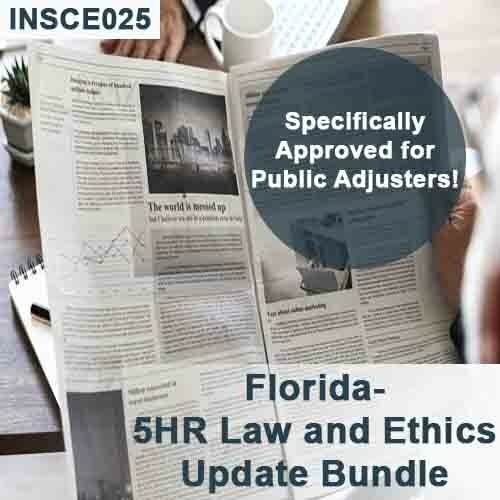 This class satisfies the requirement that Public Adjusters complete a 5-hour update course specifically approved for Public Adjusters every 2 years, which is specific to the license held by the licensee, and covers Regulatory awareness, Licensing requirements, Insurance laws, Ethical requirements, Disciplinary and industry trends, and more. The course includes six multiple-choice Unit Quizzes and one Final Exam. It is designed as a self-paced course done entirely online at your convenience. 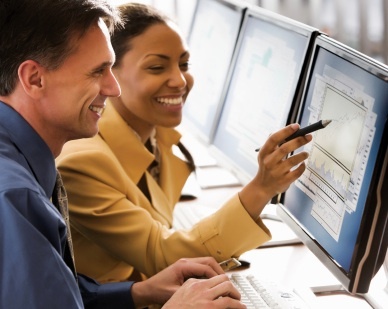 This course has been approved by the Florida Department of Financial Services for insurance continuing education credit. No classroom attendance required. This FL Intermediate CE course is approved for sixteen (16) hours of insurance continuing education credit. Get eleven of your general elective CE credits taken care of at the same time as your required 5-hour Law & Ethics requirement! 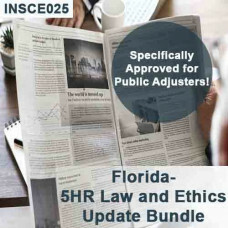 Approved for a 5hrs of CE credit for CE05320 Law and Ethics Update - Public Adjuster (CE 5-320) AND an additional 11 hours of CE 3-20c Public Adjuster Optional (good for your other general elective credits). NOT approved for 6-20 All-Lines Adjusters.